If Democrats lose control of the House of Representatives next week, as most political observers expect, there is a good chance that the House Speaker will opt to spend time with her eight grandchildren rather than toil in the relative obscurity of the minority. Even if she wanted to stay on, it's not at all clear that she would win the position of minority leader: seven Democratic incumbents and several candidates oppose her leadership  on Wednesday, North Carolina Representative Heath Shuler suggested he might challenge Pelosi for the spot  and another 20 have refused to say one way or another. Pelosi is more likely to leave gracefully, trading the red-eye slog for the pleasant commute between her San Francisco and Napa homes, and leaving the caucus in the hands of majority leader Steny Hoyer, who has been chafing in her shadow for decades. A quick retirement is not an uncommon choice for the boss of the losing party; Newt Gingrich stepped down three days after losing five seats in 1998, saving his party a potentially divisive leadership election he could well have lost. And the only reason Denny Hastert (who succeeded Gingrich) lingered for more than a year after shedding his Speaker's mantle in 2007 was to keep his Illinois seat warm for his son, who never made it past the primary. 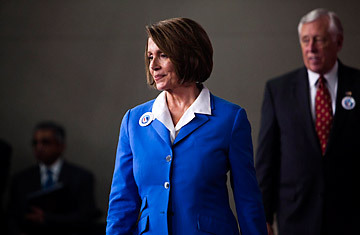 Other Democrats are sure to follow Pelosi out of the Capitol. After the GOP lost the House in 2006, 27 Republicans called it quits. But in the case of Pelosi's Democratic cloakroom, the exodus could be deeper: five of the 20 current committee chairmen are her allies from California. Without their champion, some veterans such as Education and Labor Committee chairman George Miller, who has been in Congress since 1975, may be inclined to leave. Even if they don't head for the exits, they might choose to abandon their gavels: Standards Committee chair Zoe Lofgren, also of California, is serving at Pelosi's request and has made no secret of her distaste at being her colleagues' ethical watchdog. Others are older  Rules Committee chair Louise Slaughter and Judiciary Committee chairman John Conyers, both 81, know that life in the minority holds less appeal for octogenarians. And, in any case, it might be time for some fresh blood. The average age of Democratic House chairs is nearly 70, while top Republicans are, on average, a decade younger  thanks, in part, to the 2006 spate of retirements. Democratic chairs have spent an average of 13.5 terms, or 27 years, in office, compared to Republicans who average 9.5 terms, or 19 years, in office. Serving in the minority in the House is vastly different from governing. The minority party is almost totally cut out of the legislative process, and their only path to attention is often to do their best to block whatever the majority is doing. For many of the old bulls who survived a dozen years in the minority to get their chance to govern, a return to second-class citizenship is unappealing. A spate of rank-and-file retirements is likely, giving Republicans an extra advantage Dems enjoyed in 2008: dozens of open seats in districts that haven't been vacant for decades. This could set the GOP up for more gains in 2012, though President Obama will be on the ticket next time around. See the top 10 American political prodigies. See the rising stars of American politics in "40 Under 40."